European Space Agency astronaut Alexander Gerst captured the space station's view of an atmospheric phenomenon called a glory on Sept. 14, 2018. 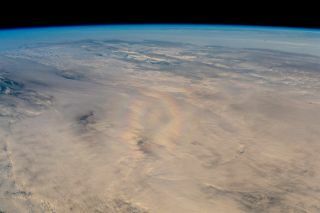 European astronaut Alexander Gerst was surprised to see a circular, rainbow-like gleam — a phenomenon known as a glory — in the clouds below the International Space Station on Sept. 14, 2018. He snapped a couple photos of the colorful glow, posting the shots to Twitter on Tuesday (Nov. 6). In a statement, the European Space Agency (ESA) explained the rarity of a glory, which results from sunlight bouncing off droplets of water in a particular way. Because the phenomenon relies on specific atmospheric conditions, it's most commonly reported at relatively high altitudes by mountain climbers and pilots, but not usually quite as high as the space station. While they're living in the orbiting laboratory, astronauts are about 250 miles (400 kilometers) above Earth's surface. ESA didn't provide any additional details about how a glory could form so high up, but Gerst's image could prompt deeper investigations. "Sometimes, a simple photograph can spark scientific investigation or even full-blown scientific research," the ESA statement said. "Alexander's pictures of aurora[s] from his last mission in 2014 are adding extra information for researchers analyzing these beautiful atmospheric displays of light." Analysis aside, let's all take a moment to glory in the beauty of this atmospheric phenomenon.